In November 2018 the Committee agreed a development plan for the Club, to ensure that goals are agreed, and development can be planned in a way that can be realistically and effectively managed and delivered. The plan itself sets a baseline to work from, although we still need to continually assess how we are progressing, and regularly review that the needs of the members are being met, altering the plans if necessary. First and foremost, in order for the club to continue to exist at all, it needs to meet it's running costs in the same way as any business would. For the club to spend on improvements and new equipment beyond usual running costs, surplus must be generated to be re-invested. As a members club, the obvious main income is from membership fees, which remains strong with good membership numbers. Many things are better with more members, such as better club racing, more socialising & friendships, and less duties!! The 'Target Membership Numbers' above are aimed at generating a strong and healthy membership base, future-proofing the club and making sure we can cope in the event of an unforeseen bad year or two (one 'membership' is a membership category and may contain more than one member). The club can also gain income from other areas, which are also going to be developed to help create a more resilient facility and generate more money for club improvements, whilst not adversely impacting on usual club activity. Secondly, the whole point of the club is that members can come and have a good time! It's therefore important that we ensure there is a suitable programme of events on offer, and there is a planned increase in activities and trips on offer over the next few years to improve this further. 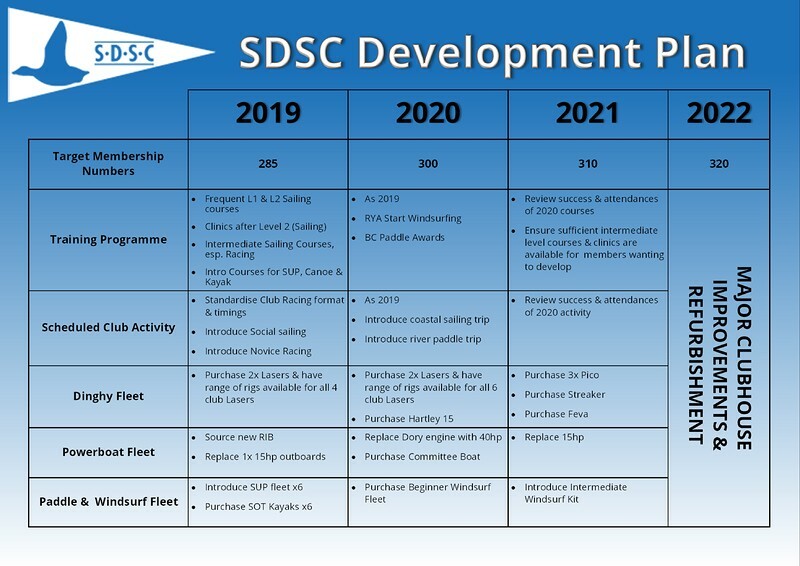 Also we need to make sure members are being properly supported in their development from starting sailing for their first time, to feeling comfortable and skilled enough to come down and get out by themselves, for example. The new Training and Activity Programme for 2019 has been developed to make sure these suitable pathways for progression are in place, providing a firm foundation for the following years growth. Thirdly, there is a lot of supporting framework required to run the club successfully. For example, the club needs dinghies for people learning to sail, or for members who don't have their own boats, or want a different boat if they've brought guests along. Powerboats are used for safety cover and training purposes. The clubhouse, grounds and pontoon all need keeping in good condition for use. 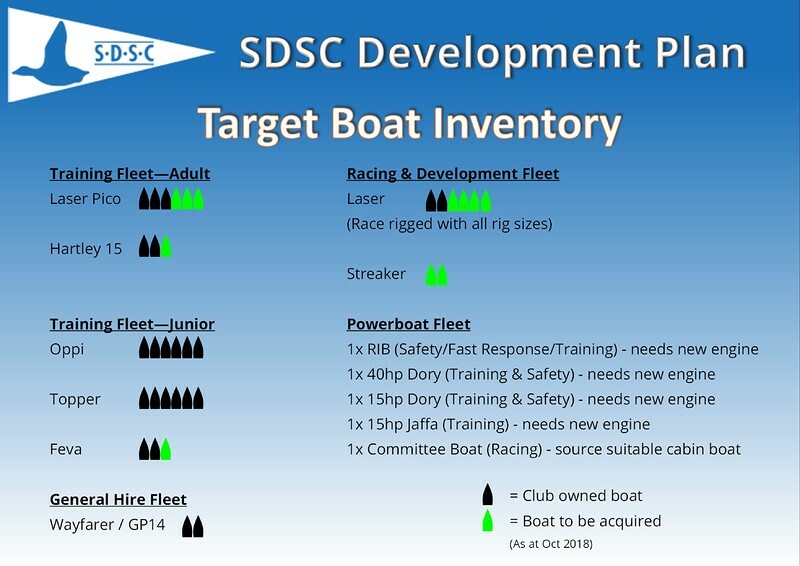 The Target Inventory below sets out the ideal fleet of club boats in order to deliver the activity programme and meet expected demand over the next few years. This has been mapped out into the plan above to achieve it in a manner that's affordable. There's also a general move towards boats that require very minimal maintenance, which will reduce the times where club boats are unavailable for use, as well as reducing club running costs, further supporting the two aims above. This Inventory will also be periodically reviewed to make sure it remains suitable for the members and club's needs.